From RealtyTrac (a foreclosure information tracking service) and Money/CNN, the new numbers are out. We're now #5 in the country, with one foreclosure for every 640 households. 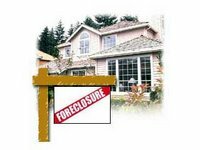 We're #2 in total foreclosures, with 11,413 filed last month. Our total is now 49.6% ahead of this time last year, which (interestingly enough) puts us at mid-pack in relation to % increases in other states. At a local Pizza joint in Bradenton, my family and I saw a group of men having some pizza and beer. They looked pretty glum. My husband and I guessed they must be in the construction business. They were so down in the dumps. I felt sorry for them. Turns out they are in the mortgage business. When the owner came out to say hi, he asked them how business was. One guy said, it stinks, another asked the owner if he had some property he wanted to refinance. Kind of hard to believe there are still those that think things will get better when all the northerners move down after a cold winter. Yeah right! The housing bubble is not going to burst....IT GOING TO CORRODE!!! I had Thanksgiving with my brother-in-law, [now a former mortgage broker], mostly recently from N.C. He's living with my other sister-in-law, cuz he hasn't had a job, or a pay check for 4-6 mos....He's broke....55 years old, and broke, cuz he put all his savings into the business that went BUST!!! He personally signed notes for the business, and doesn't know how he's going to pay for them??? Besides feeling BAD for them, and giving them some money....what the heck can I do???? He needs to get a job at Wal-Mart or something!!! "EVERYTHING IN FLORIDA, RUSTS, ROTS, OR CORRODES....including the people"
Crazy - I am loving your quote and your "heart-warming" Thanksgiving tale. So much greed, so much b.s., and now it's time to pay up. The carrot for him was the money...on sub-prime [depending on the lender] there could be upto a 3.5% bonus commission...Yes, it's all spelled out in the papers, and nothing that he did was illegal, that I know of!!!! [0% interest for 5 yrs or something].. you remember??? Totally screw up the report!!!! He'd say...I told you NOT to do that...They did!!!! The wife, and I discussed this at great length....and said he's making a big mistake....but how do you tell a 53 yr. old man, how to run his life???? >>> NOW << he suffering, and in all probablity, so are many of his past clients!!!! [only I can't tell you WHEN]..
At some point, the economy is going to slow down....and the FDI [Foreign Direct Investment] will be directly diminished....causing the dollar to plumet.....at that juncture, bond holders, will be feeling severe pain [lose] in their holdings....and will sell bonds....Interest rates will spike up to double digit...and the ""FULL EFFECT" of a housing crash will they ensue!!!! The battle ship U.S.S. Florida, is in a fight for her life!!!! Yet she floats, crippled as she is, relentless, in denial of her infliction!!!! What will it take to bring her down???? She will secum, to the onslaught of the nemises of real estate!!!! She will sink into the sea of DEBT!!!! >>> BUT << who cares about Orange County """CALIFORNIA"""
We have got enough problems right here in Orange County ""FLORIDA"" that don't anywhere compare with CA. The SOS is out for Florida!!!! ""LAND" isn't worth the price of dirt...PERIOD.. Ask any native American what land is worth???? Price location, can escalate to extreme values...eg] Japan!!! Commerical real estate in Tokyo has dropped >>> 99% <<<..."""AND IT'S STILL ONE OF THE MOST EXPENSIVE CITIES IN THE WORLD"""
The existing homes sales are out for Volusia county [along with rest of the state].. Things 'picked-up' ever so slightly, with 262 [oct] existing home sales vs. 258 [sept].. Realtors gotta be dying on the vine..rotting is more like it!!! Why does everyone bash SOH? As a born and bred Floridian I think it is a great idea. Why should I be penalized because some idiot is bidding up the homes in my neighborhood to unrealistic prices. I love watching this collapse/meltdown take place. It warms my heart to see all of these wannabe nouveau riche Hummer driving white trash come to the realization that they aren't as wealthy as they thought they were. And in another few years when the last speculator goes BK I will be there to purchase their property for 20-30 cents on the dollar. For you fisherman out there think of the speculator as that big tarpon that put up a good fight for an hour or two and just when he reaches the gunwale to be released a big hammerhead (me) comes by and eats him for lunch, lol. I think that the SOH had good intentions but unfortunately it has backfired for a lot of folks. What will you do if you have to move and purchase another property? I read the SOH may change so you will keep your low taxes on your next property but If that doesn't happen you are certainly not benefiting from SOH's at all. In fact it seems to me this tax law has make you a prisoner in your own home. What about the senior citizen that wishes to purchase a small condo to get out of yard work etc. now faced with a hefty tax bill? Sure it was negative for flippers that are left sitting on unsold properties but for the NON flipper, the ones that actually wish to live in their homes and raise families etc..it is unfair for them. So where were you in 1992 when EVERBODY voted on and passed the SOH!!!! FOR GOD'S SAKE..LET THEM LIVE IN PIECE IN THEIR RETIREMENT, ISN'T THIS WHAT FLORIDA WAS PROMOTED AS???? When we purchased a home in 1995 and when me moved up to a larger home in 1999, SOH wasn't a problem. The problem with the SOH is the flippin Flippers who drove the cost of real estate up! As real estate values decline in Florida, the SOH won't be an issue anymore(except the idiots that bought 2003-2006)! Heck, if we didn't have to move out of state in 2000, we'd still be in our old home and loving the SOH!!!!! I am not willing to pay three times more in taxes as my neighbor and I'm certainly not willing to pay three times more for the same house! I do hope that they will allow people to take their Homestead exemption if they move! Especially for the elderly that can't afford to downsize! Today’s report on Sacramento has been released! Do Americans [Floridians] have the stomach for another such epistode???? """THE MARKET"" will do what Bernacke won't do!!!! At some point something is going to have to give....AND I DON'T THINK THE SALARIES ARE GOING UP BY THE REQUIRED AMOUNT TO COVER THE COST OF THESE HOMES!!!! Crazy says: You ain't going to believe what I tell you, NOW...""BUT""
When the economy slows down....."EVERYBODY" is going to be thinking that interest rates are going to go ""DOWN""
What do you think happened during the GREAT DEPRESSION???? HE WON'T HAVE A CHOICE, JUST LIKE THEY DIDN'T HAVE A CHOICE!!!! The dollar is going DOWN, and interest rates are going ""UP""
I am right there with you - we're renting a house and (via our landlords who live a few neighborhoods away) are paying nearly double the property taxes of everyone else on our street. Now how is that fair? I'm not smart enough to know what's going to happen when....BUT, WHEN, IS GOING TO HAPPEN!!!! No future here!!! after 25 yrs..
Is this the first 'real' indicator that the bubble has really burst???? Buying at 50% off may NOT cover you after all!!! After reading your website, I get kinda down. Im in Miami, 23, Married, renting (very cheaply)currently with parents and have no debt at all, with a bit of savings. My wife is a Registered nurse, and I am working on my PHD to become a professor. I simply cant fathom how we would ever be able to live in Miami. I do not want to move away because of family and connections I have here. Do you think I will ever be able to afford a home? If so, when? It seems so unrealistic. My wife and I would have to be making 100k each to keep up without being entrenched in debt. We are first time buyers, we dont have equity or any property to back us up on a purchase. It seems so unfair. I have lived in Miami, in the same house, all my life. Am i going to be forced out of the state? From what you say, it seems you ARE on the right course, for sure!!!! """STAY OUT OF DEBT" till your ready to buy.. Yes!! It sure seems depressing for sure!!!! Right "NOW", CRAZY would estimate there are over ||| 1 MILLION |||| houses sitting empty.....""PERIOD""
dictate that prices are going down....BIG TIME!!!! """Better to go to bed suppless, than wake up in debt"""
Hah!!! The politicans are meeting in January to solve the insurance crises that THEY created, with advent of Citizens Insurance...."BUT""
[and read what they guy from the insurance industry says:]HHAAAAA!!!! Crazy thinks, the politican should just pass a law, and seceed from the Union of the US, and petition for a confederation from Canada ...They don't have many hurricanes up there!!!! The Canadian Snow-birds would certainly like it....it would seem just like HOME!!!! Subprime lending has driven the latest stage of the credit bubble, which puts it on very shaky ground indeed. “32.6% of new mortgages and home-equity loans in 2005 were interest only, up from 0.6% in 2000; 43% of first-time home buyers in 2005 put no money down; 15.2% of 2005 buyers owe at least 10% more than their home is worth (negative equity); 10% of all home owners with mortgages have no equity in their homes (zero equity); $2.7 trillion dollars in loans will adjust to higher rates in 2006 and 2007. Roll them all up into "ONE" big foreclosure... & Auction them all off......TO PEOPLE WHO HAVE SAVED THEIR MONEY, AND NOT PRETENDED TO BE RICH, BY BORROWING SOMEBODY ELSES!!! MONEY ALWAYS FINDS IT RIGHTFULL OWNER!!!! We got them, right where they want us!!! HHUUUHH!!!!
""" I LOVE THE LOBSTER POT COMPARISON"""
Which comes first....TURNING RED.....OR SEEING THEM ""pop""
They'll be beggin me to buy it from them!!!! Crazy, if it gets too bad, you might get one from the Dollar Menu! I plan on buying my next house at Dollar Tree. To the anon poster regarding purchasing in Miami: Your plight is the EXACT same as all of us here. We all want to own, and we all see something that the rest of the "sheep-le" in this state don't (actually, it's more like that we smell somthing rotten). Simply put: Home prices in Florida are completely out of whack with reality. Median incomes can not support these prices, and we're (finally!) seeing the market respond accordingly. We are like the "Island of Misfit Toys" to the REIC (real estate industrial complex - composed of builders, realt-whores, mortgage brokers, appraisors, etc...). They have made a lot of "free money" off the brainless general public in the past 3 years, and they don't like us (and anyone in the media who reports on the bubble) for pointing out the truth. Some of us believe we are in for a rapid decline, others of us believe we're in for a long, slow decline. In either case, expect prices to drop - by a lot. And then you can live happily ever after in your "PARADISE FOUND IN FLORIDA""
I just about fell off my chair laughing at your post! I LOVE IT! You make the Market's Down Hill Ride a bit more humorous to me! And I am not being sarcastic!! Man, When I had the concrete business, I should have paid all my guys in enchiladas! Well, I did go buy them KFC, they really loved the Mac & Cheese from there! Shipping them back filled with rice?....! Car Auctions Nice blog. Check out my blog for the #1 source for car auctions. Newport beach real estate The Most Powerful real estate source for california real estate on the net. A list of Orange County SEO Companies isn't necessary, the only name in Orange County SEO is, Atomic Search Engine Optimization. I was impressed to have top page listings in less than 30 days. Nouveau Riche The Most Powerful real estate ivestment information source. PNOBQO Your blog is great. Articles is interesting! gtuW3i Please write anything else! cleanout, houses,hotels,office building, rentel's and etc... No job is too big or too small. From top to bottom cleanouts in 2 days or less. We are licensed and ins. Affordable SEO Set it and forget it, we do it all for you! Build links and build your web presence in the search engines.